Irish poet Seamus Heaney's correspondence, now open to the public at Emory's Rose Library, is part of the largest research holdings of Heaney material in the world. More than 40 years of Nobel laureate Seamus Heaney's rich correspondence is now open to the public at Emory University's Stuart A. Rose Manuscript, Archives, and Rare Book Library. With the blessing of the Heaney family, hundreds of letters from the late author, dating from 1963 to the early 2000s, collected by Emory's Rose Library over the years, are now fully available to researchers and visitors. "Heaney's papers at the Rose Library, totaling more than 50 linear feet, represent the largest research holdings of Heaney material in the world," says Rosemary Magee, director of Rose Library. "The collection provides an intimate look at Heaney's work and life, as well as insight into several generations of Irish, British and American writers he corresponded with over four decades." "Heaney's correspondence is complemented by a near-complete holding of his publications numbering nearly 500 items," says Kevin Young, curator of the Rose Library's literary collections and of its Raymond Danowski Poetry Library. "Items range from his earliest pamphlets to his poem 'Awake,' a broadside printed by our Raymond Danowski Poetry Reading Series and one of his last publications before his untimely death in 2013." Also included is a collection of handwritten essays and poems, as well as audio/visual materials. 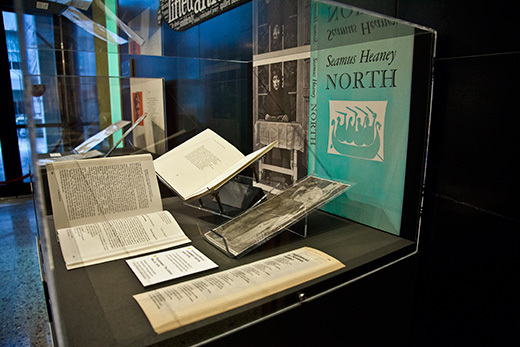 In 2014, Emory celebrated Heaney's work and legacy in a major exhibition on campus titled "Seamus Heaney: The Music of What Happens." 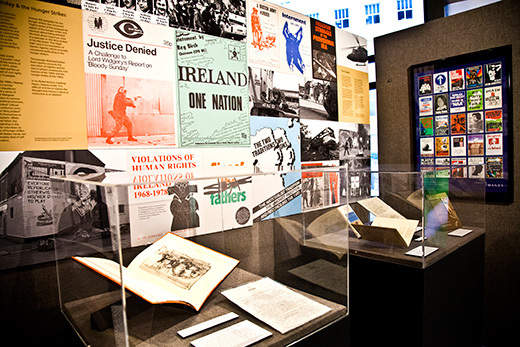 Curated by Geraldine Higgins, director of Emory's Irish Studies program, the exhibition will travel to Dublin in 2017. 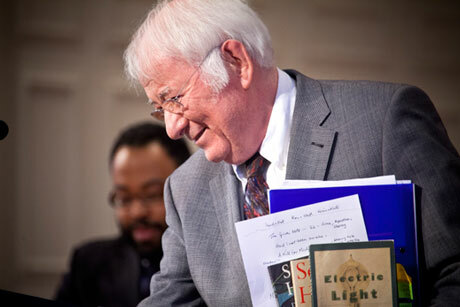 "Heaney's placement of his papers at Emory, starting with his gift of the manuscript of his 1988 Richard Ellmann Lectures in Modern Literature, helped cement Emory's place as a center for Irish literature, especially poetry," says Ronald Schuchard, Goodrich C. White Professor of English Emeritus and founder of the Ellmann Lectures. Since then, the Rose Library's collections have expanded from its wide-ranging W. B. Yeats holdings to a comprehensive collection of the Belfast Group of writers. The collection includes the archives of Belfast writers Michael Longley, Derek Mahon, Ciaran Carson, Medbh McGuckian and Pulitzer Prize-winner Paul Muldoon. Also included are Irish writers Edna O'Brien, Thomas Kinsella, poet-publisher Peter Fallon, Rita Ann Higgins and Eamon Grennan, who coined the phrase for the collection, an "Irish Village at Emory." 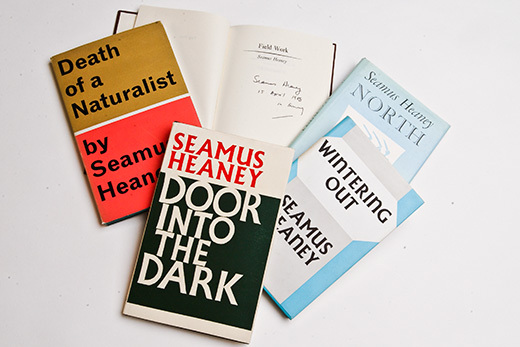 Together with several related collections in the Rose Library — such as the papers of Seamus Deane, Frank Ormsby and the Honest Ulsterman archive, Tom Paulin and Joan McBreen — the Seamus Heaney materials form an integral part of Emory extensive documentation of Irish literature worldwide. "The timely opening of Seamus Heaney's papers and correspondence," says Schuchard, "will bring a new wave of students and scholars from many nations to the reading room of the Rose Library, where studies of the Nobel Laureate's work, his literary relationships with writers worldwide, and much of the history of contemporary poetry since 1960 will be written."